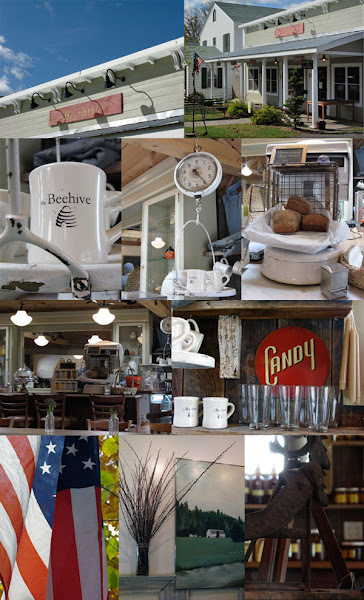 While exploring this weekend up by the cottage, we found an adorable town and a really cute place to eat. The little cafe is called The Beehive, and it's on Main Street in Franklin, New York - a little oasis of turn-of-the-century buildings. It's a charming spot in an even more charming town. They also sell great homemade bread, and it seems to be the local gathering place for the community, which gets extra points with us. The Yelp review is here, with more pictures. Update - September 2010: Sadly, The Beehive is now under different management. While we think it's still the best option for eating in Franklin, it just doesn't have the great style or attention to detail that it used to. The differences are subtle, but make a big difference.